After four weeks of mass protests, the Euromaidan movement in Ukraine’s capital city of Kiev may be running out of steam. The bailout agreement of cheap gas and $15 billion in loans that Russia offered to Ukraine on December 17 has emboldened the government of President Viktor Yanukovych. Despite the Euromaidan’s popularity, organization, and overall discipline, the protestors that numbered in the hundreds of thousands on three consecutive Sundays—and tens of thousands more this past Sunday—were unable to compel their government to sign an Association Agreement with the European Union. This agreement would have demanded a raft of political and economic reform in exchange for free trade and, eventually, visa-free travel. But all is not lost. Ukraine is still nominally a democracy. Coming off the Euromaidan’s energy and organization, Ukraine’s opposition has a good chance to mount a compelling electoral challenge to Yanukovych in the February 2015 presidential election. Ukraine’s protests were not only in favor of joining Europe, they were also an expression of discontent against a government that engaged in authoritarian backsliding from the moment it was elected in 2010. Beginning with an immediate recentralization of power, the Yanukovych administration has governed more in its own political and economic interests than those of the broad population. Protestors tend to view the government’s retreat from EU association on November 21 as a reflection of this trend. The unexpected brutality of a special police unit against a group of encamped protesters nine days later was the catalyst that gave the demonstrations their renewed force. Western coverage of events typically blames Russia for pressuring Ukraine to walk away from the European Union. Ukrainian protestors, however, identified the right target: the Yanukovych administration. Before Moscow began issuing dire warnings of plummeting bilateral trade in the wake of an EU-Ukraine deal, Yanukovych was already resisting the agreement thanks to EU insistence on freedom for opposition leader Yulia Tymoshenko—the former prime minister, presidential candidate, and archnemesis of Yanukovych—who was sentenced in 2011 to seven years in prison on trumped-up charges of abuse of power. Freeing Tymoshenko could complicate Yanukovych’s efforts to achieve victory in the February 2015 presidential election. An early October poll by Ukraine’s Razumkov Centre shows Yanukovych losing the election in a second round against Tymoshenko or two other leading opposition contenders. While the protest movement has not achieved its immediate goals, it has had some success. It established a mass constituency for change and reinforced Ukrainian civil society’s organizational capacities. The movement has also reinforced the ability of opposition parties to coordinate and speak in one voice. Finally, it garnered the unabashed support of European and U.S. leaders. Western sympathy for the Euromaidan is understandable. A mass movement in favor of European association, democracy, and governance—what’s not to support? Nevertheless, foreign supporters of the Euromaidan should keep a few things in mind. First, the protestors do not represent the people of Ukraine. They represent a constituency. Yanukovych may not be that popular, but the government still has its supporters, especially in the country’s eastern areas. Many Ukrainians would not like to see a change in government produced from the streets. Moreover, while polls indicate that association with the European Union enjoys more support than other options, including membership in the Russia-led Customs Union, it does not have the support of a majority of Ukrainians as Western media and government officials frequently report. This is not to say that detractors cannot be won over or pro-EU positions will not increase over time. But U.S. and European officials who speak in favor of Ukraine’s European choice should recognize they are choosing sides in a domestic debate. Second, Ukraine’s choice is not the Kremlin’s doing. A different government would have rebuked Russian pressure, as have governments in the far weaker neighboring countries of Moldova and Georgia. Even the Yanukovych administration could have rejected Russian pressure if it wanted to. Hundreds of thousands of protestors—and the constituency they represent—would lend it their support. Western policymakers may be disappointed in what they view as Russia’s overwrought reaction against Ukraine’s EU association and efforts to derail it. But the Ukrainian government made its choice. Third, focusing on the Euromaidan’s European choice risks confusing geopolitics and geography with values. Ukrainians will not embrace liberal democracy, rule of law, and progressive values by choosing to be European. Many Ukrainians protesting in favor of EU association represent parties that constitute the extreme right elsewhere in Europe. And Ukrainians who have their doubts about EU association do not constitute a bloc of authoritarian-minded citizens. European and U.S. policymakers may believe that the best opportunity for Ukrainian democracy and good governance lies with the institutional reforms and economic linkages that EU association can provide, but they need to continue saying just that. It is past time to jettison the unproductive and ethnocentric language of European values versus Eurasian values—of West versus East. Finally and perhaps most critically, supporters of Ukraine’s association with the European Union gave up trying to find ways to promote Ukrainian governance reforms that take into account Ukraine’s existing economic ties with Russia. Moscow was careful to express only technocratic concerns with the EU-Ukraine deal. Its objections should have been anticipated far earlier in the process and substantively addressed or dispelled. Fortunately, they still can. Now comes the hard part. Ukraine’s Euromaidan supporters seek to change their government. It is probably the only way Ukraine will ever sign an association agreement with the European Union. There is also little reason to believe that the Yanukovych administration will suddenly become more responsible and responsive to its population. But if Yanukovych was already eager to consolidate his power, Ukraine’s deal with Russia has given him the incentive to double down. Having run Ukraine’s economy into the ground, the Yanukovych administration now has the Russian bailout to strengthen its position and weaken that of the opposition prior to the 2015 election. But there’s more to it than that. A nontransparent deal with Russia made for short-term political gain sounds just like Yanukovych’s justification for imprisoning Tymoshenko. On top of the other questionable policy choices he has made, Yanukovych must worry that this most recent decision assures him a dose of reciprocal justice after leaving office. If the Euromaidan has indeed lost steam, its supporters face real challenges in achieving their goals. It will not be easy to overthrow an increasingly authoritarian Yanukovych at the ballot box. Yanukovych is unlikely to grant clemency to Tymoshenko until after the 2015 election—unlike Russian President Vladimir Putin, who on December 20 unexpectedly freed Russia’s most famous prisoner, former oligarch Mikhail Khodorkovsky. But the challenges are not insurmountable. 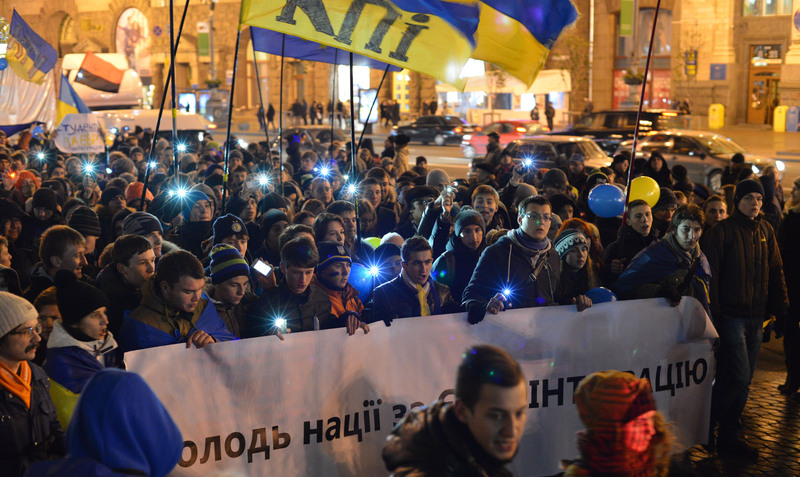 It is time for Ukraine’s opposition to set its sights on 2015. Cory Welt, an Adjunct Fellow at the Center for American Progress, is associate director and research professor at the Institute for European, Russian, and Eurasian Studies of The George Washington University’s Elliott School of International Affairs.